SALE $35.00 Facial A $50.00 value! 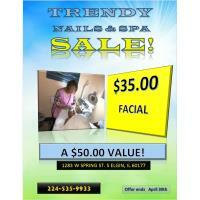 Trendy Nails Spa Sale $35.00 Facial - a $50.00 value! SALE - $35.00 Facial - A $50.00 value! 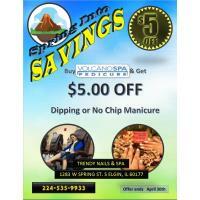 For a limited time Hand & Stone in South Elgin is offering a $99.95 spa day promotion. This promotion includes our Signature Facial and our Customized Relaxation Massage. At the end of the spa day you will go home with a promotional gift card for $20 to use on your next visit!